Moscow’s Strogino area hosted its third Red Bull flight contest last weekend. 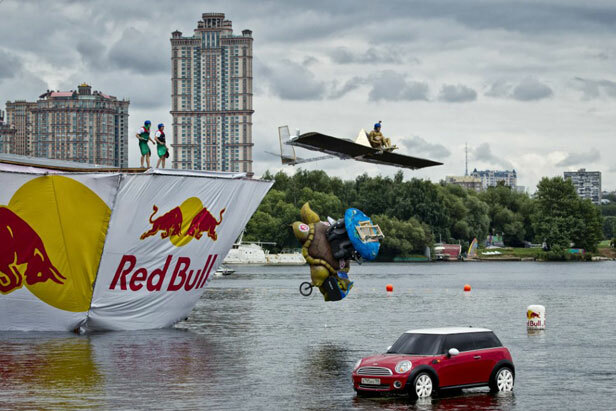 The Strogino area of Moscow hosted its third Red Bull Flugtag last weekend. On its previous appearance in Moscow, the event attracted 106,000 spectators, and a huge turnout was expected again as the event of the year hit town. The “flugtag” contest—translated from German as "flight day"—brought costumed contestants from as far away as St. Petersburg to try their skills in aircraft design and aviation. Teams built a flying apparatus with three criteria in mind: length of flight, creativity and artistry. On contest day, teams were also judged on a short performance on the takeoff ramp. By Flugtag rules, aircraft must have a wingspan of no more than 33 feet and a fuselage not wider than 13 feet. The maximum weight of the aircraft cannot exceed 440 pounds.